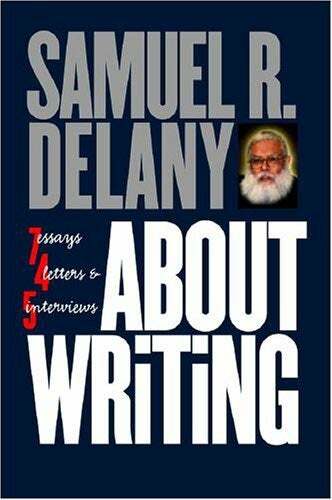 Samuel Delany not only helped redefine science fiction, he's one of a few SF writers who teach writing at the college level. So I was excited to see he'd written a book about writing. The book in question, About Writing, isn't quite what I'd expected from someone who's been teaching creative writing for the past thirty years. It's definitely not a style guide or a tutorial on fiction writing. (The book's subtitle, "7 essays, 4 letters & 5 interviews," could be a bit of a clue.) Instead, it's Delany's ruminations, gathered over the years, about both the craft of fiction writing and the writer's life in general. There are fantastic insights in there, as well as advice that might make you rethink everything about your approach to fiction writing - even if you end up disagreeing with some of it. [This book] deals with three other topics and the relations between them. One - which it shares with most books on writing - is, yes, the art of writing fiction. The other two are far less often discussed in classes and rarely figure in such "how-to" books. First, how is the world structured - specifically the socio-aesthetic world - in which the writer works?... Second (and finally), this book discusses the way literary reputations grow - and how, today, they don't grow. There are some good nuts-and-bolts essays - in particular, the essays on "Thickening The Plot" and "Characters" are pretty helpful. Even here, though, Delany throws some curveballs, albeit welcome ones. Take the essay on plot, for example. Delany goes off on some tangents, and also seems to be discussing scene-setting instead of plotting. But it all comes together, when he explains that the key to a good plot is actually visualizing the events of the story as if they really happened. And if you're forced - by a cranky critique group, or your own conscience - to change the story's events around, then you must revisualize the story all over again. See it in your mind, through the lens of key details, until you can convince yourself that "on some level the story actually did happen (as opposed to 'should have happened') in the new way." It's actually pretty amazing advice. A lot of the other nuts-and-bolts advice winds up in the back of the book, in an appendix called "Nips, Nits, Tucks And Tips." Including info like when to use the first person, how to punctuate dialogue, and the dramatic structure of fiction. The rest of the book includes speeches, essays and letters, where Delany tells funny anecdotes and reminisces about his early friendships with storytellers and his encounters with other science fiction writers. (I didn't actually know he taught Vonda McIntyre at Clarion, but apparently he did.) He explains why Toni Morrison's The Bluest Eye is a bad book, discusses how to achieve literary acclaim (including a discussion of Doris Lessing's refusal to cooperate with a would-be biographer) and a lengthy discussion of the state of writing and editing today. The book is full of insights and startling arguments, but it's probably not a book you'll read in one go. I've found myself picking it up, reading one essay, and putting it down again for a day or two. It might actually be that rarest of creatures - academic bathroom reading. This isn't, by any means, a criticism. It's a very dense, ruminative book full of ideas that will pop into your head a few days after you read them. But it also feels a bit, at times, like Delany is sitting in an overstuffed armchair lecturing the reader, which goes over better in smaller doses. Luckily, the book comes packaged with the dosages already divided up.